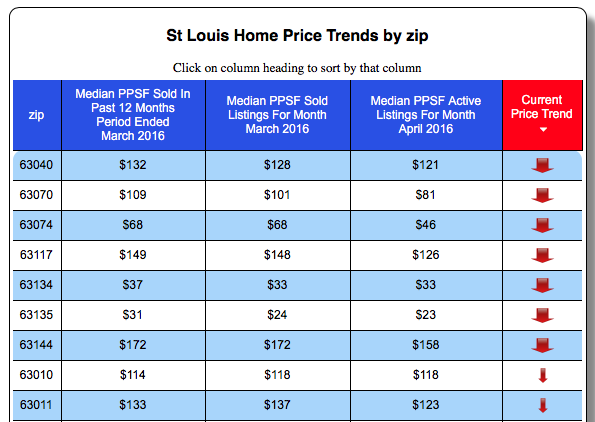 St Louis home prices appear to be trending downward a little even though we are in the midst of a fairly robust spring market. 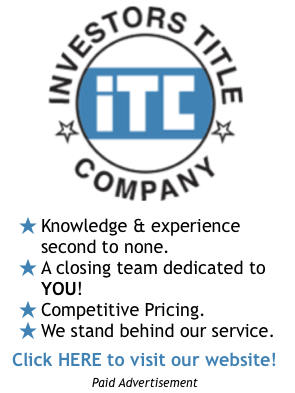 This is based upon the current price per foot of active listings for sale compared with what home sales that closed last month, as well as prior 12 months, sold for on a per-foot basis. 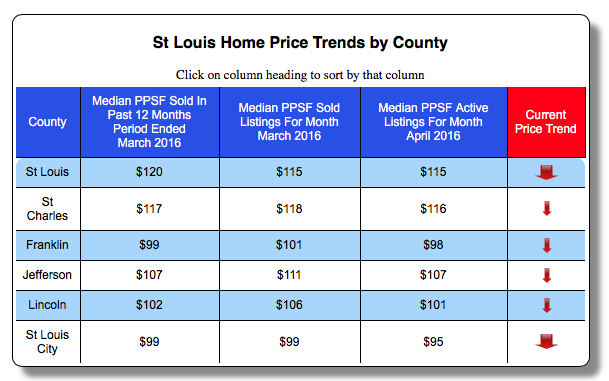 As the tables below show, the price per foot trend is down in all 6 counties we track, with the biggest downward trends showing in St Louis County and the city of St Louis, both of which have seen the median price per foot of active listings fall below what homes in those counties sold for in the prior 12 months. Condo prices trending downward as well.. 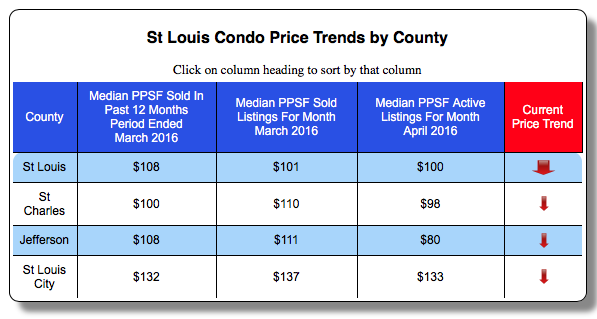 Beneath the table for home prices is a table showing condo price trends which shows St Louis condo prices trending downward as well. What I have discussed thus far is at the county level, but you must remember real estate is very local and home prices, sales, etc, can vary greatly within the same county. 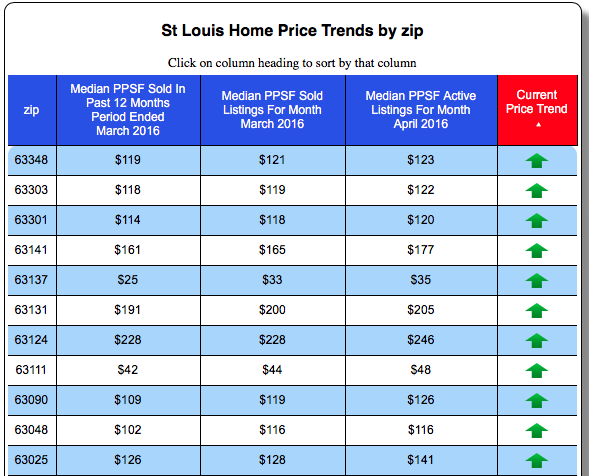 For example, see the chart at the bottom of home price trends by zip code – I have shown it two ways…first where the prices are trending upward and next where they are trending downward. 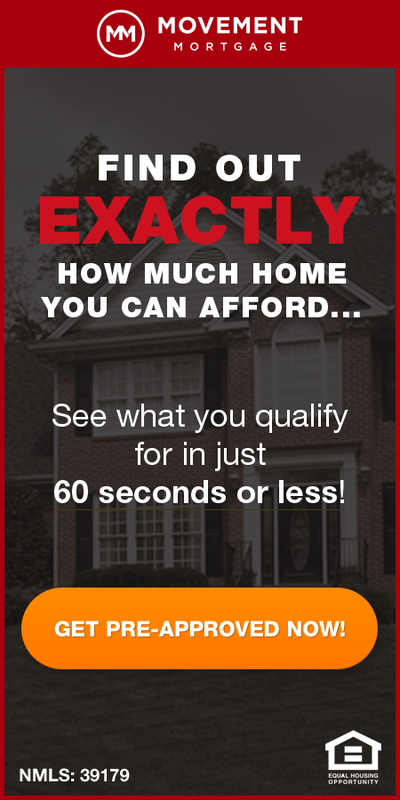 As the tables show, there are several zip codes in the area with definite upward trends in home prices as well as areas going the other direction as well.